When I move the blade by hand it feels "chunky". I took the belt off so that I was just spinning the blade and arbor and it "hesitates" every 1/2" or so. It doesn't spin freely even with the belt off. As I pull the blade along I can feel a soft thump, thump, thump. No hard clunking, but it requires an increase in pulling power to get it past those points. I have a spare arbor (brand new) It has one bearing, the inside one near the threads. I guess I should order the outside bearing and tear the thing apart right? From what I'm been reading, you're supposed take the entire arbor housing out through the rear to get to the arbor bearing retainer screws. That allows you to remove the outside bearing so you can slide the arbor itself out. Why not just cut a piece out of the sheet metal housing and do it all from the side of the saw? As far as I can tell, that would give me direct access to the 3 arbor bearing retainer screws. If I then covered the hole with a piece of plywood (and sealed it up) I could hang all sorts of accessories from the board. ;-) I'd also have easier access for future maintenance/cleaning. Other than destroying the re-sell value of a saw that I paid $110 for in the mid-80's, is there any reason not to go in through the side? Removing the assembly is two knobs and a dozen screws; it too gives full access, including to parts you won't get to through a hole. That seems to me quicker than making a hole, and neater. Yes, the arbor bearings are toast. I´ve had this problem. There is no need to cut through the side sheet metal to get the arbor out. It went together without doing any such thing. It´s best to take the wings et al off and turn the saw upside-down on a workbench. On mine, the hard part was taking the arbor itself apart. I had to make a special spanner wrench (using a metal lathe and a vertical mill) to unscrew the ring nut that holds everything in. I looked up your unit - no special tool needed. When you have the bearings out, take them to a local bearing place to be matched. Then put it all back together. There are places that will replace the bearings for you if you send them the arbor as well. It was ordered directly from Sears maybe 3-4 years ago. I have no idea how long they had it on the shelf or how long the bearing itself was in the shelf. For that matter, I don't how long any bearings that I order today have been on a shelf. They might be older than what's on the spare arbor. Other than tracing down a lot number, assuming There is one, I'm not sure how one would know the age of a given bearing. If the belt is off, the blade should not be doing that. I would say the bearings are done. Can you remove the top and arbor trunion assembly? You were the first person I thought of while I was posting my question. Don't know yet. It still works and I need to finish the bench first. I'm close, may even be done with the table saw, but I don't want to take a chance of needing the saw before I'm done. It seems to me that if I start removing major components, such as the top, the arbor housing, etc. it's going to mean a major tune-up once I get it all back together. On the other hand, if all I need to do is remove is 3 screws to get to the outer bearing, I should be able to slide the arbor right out and then right back in. Remember the Monza? If I recall correctly, you had to disconnect the motor mounts and tilt the engine to get to one of the spark plugs. I think it was on that car that somebody figured out that you could get to the spark plug by cutting a hole in the wheel well. I may have my cars/hacks mixed up, but that's the concept I'm talking about. Why take half the saw apart just to get to 3 screws that a thin piece of sheet metal is blocking? Maybe it's not that simple but that's why I asked. I had a Craftsman contractors TS, Bought it new in 1983. Cast Iron top. So with this saw the trunion assembly attaches to the table top. You probably know this but you set the blade parallel to the miter slots by loosening the bolts that attach the trunion assembly to the top adjust and tighten. The top simply bolts to the outer housing/frame/sides to the saw. 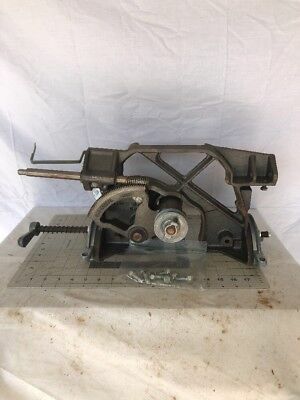 If you do not loosen the trunion/top connecting bolts and simply unbolt the top from the frame/housing/outer sides of the saw and lift the assembly out, you should loose no adjustments. Unlike a typical cabinet saw. The cabinet saw trunion sits on to and bolts to the saw cabinet and then the top bolts to the cabinet. A funny story, many years ago our dishwasher water pump failed and I was not about to pay a repair bill. So I bought the repair parts and over the coarse of a couple of days managed to successfully repair the dish washer. I did this by laying on the hard floor and working in the 4" space under the dish washer. Some years later I realized that I could have removed 2 screws attaching the dishwasher to the counter top and simply rolled it out and turned it upside down with full unobstructed access to everything. I don't know if you can actually lift the assembly out because of the tilting and/or raising shafts that protrude through the holes in the case. I've certainly never read/seen anyone do it that way on the ole interweb. Remove a knob or two, the pointer, and the tilt shaft comes loose when you disassemble its socket (two or three screws). The motor (two screws) and mount just pull away. On mine, the arbor didn't require treating, but other mechanisms worked much better after cleaning and lube and readjustment. Let's make sure that we are all talking about the same process. Leon is suggesting that I do not remove the trunion assembly from the top; instead he is suggesting that I remove the cast iron top and trunion assembly *as one piece* from the base. If that is possible, then I would have access to the arbor assembly but I wouldn't have to do any re-alignment of the trunion once I was done. My question is: After you remove both rotating knobs and the tilt lock handle, can you bring the shafts inside the case so that the trunion *and* top can be lifted off and placed on the workbench as one piece? My recollection is that the tilt strut flops loose, so yes, it would not prevent lifting out the whole apparatus, table and all. The top, though, is heavy; a two-person lift might be recommended. And, you'll have to shift/swivel/tilt the whole thing to clear the lip of the case. Reassembly with the loose strut may be tricky; I recall replacing the top first, then attaching the underparts. Thanks. Sounds like some way of supporting the loose strut so that it can be "aimed" back through it's hole might be something to consider. Some method that could easily be removed from the back once the saw was reassembled. The again, maybe it's just not worth it. Aligning the trunion shouldn't be that tough. Apparently, it's done all the time based on how many people have re-habbed these saws. The worst thing about realigning the trunion is that all the zero-clearance throat plates need rework. I have some blank inserts that I cut from the bottoms of my old kitchen drawers. Hardwood plywood and extremely flat, even after 60 years. When those blanks are used up, I've got enough bottoms to make 6 or so more. Ping Derbydad, Building cabinets and face frames with a track saw. Where to find Powermatic 64 bearings? How do SawStop Table Saws Compare as Saws? Craftsman table saw tuning semi-saga. Table Saw Recommendations: New or Used? Share your accidents and close-calls so others can learn from them? Table saw or router table? Circular saw to replace burnt table saw motor? Anyone use the Grizzly Sliding Table?